September 17th 2013 -"I hope that you enjoyed the portion of my ceremony words, and my officiating of Tamra and Eddie's O.C. 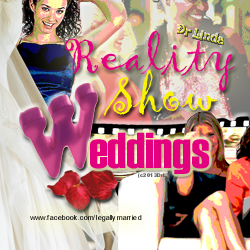 Reality Show Wedding!" seen on Bravo T.V. last evening. There is so much to say, and I am receiving compliments already. But, I do want to talk about the words, the feelings of the moment, and so much more. As we start off, I would love to know what you liked about my custom written words, and all related to my contribution to the wedding moment. Here on on www.facebook.com/legallymarried, join the discuss of the Tamra's OC Wedding with myself, Dr. Linda - Specially chosen to preside Tamra and Eddie's wedding ceremony for Bravo T.V. "Let's Talk!" Also, free to write a lovely wedding ceremony or vows for you, just like I did for my celebrity wedding ceremonies.